A number of documents relating to crowd flow from around the world use area per person as the measurement. This can be confusing as it is difficult to�visualise the space around a person. We recommend that you always use density which is expressed as people per square metre. Density is easier to visualise and it maintains a clarity for crowd safety. This clarity is vital for decision making when you are in charge of places of public assembly. The links (below) are for pages with short video clips of a workshops experiment I run to illustrate the relationships between crowd density (people per square metre) and crowd flow (people per metre per minute). As density increases the crowd flow rate drops. 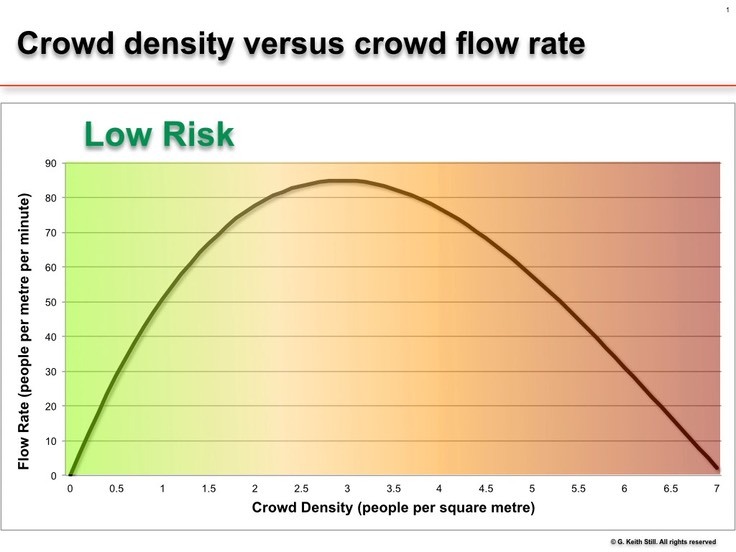 This is essential to understand when planning for crowded spaces.